The announcement was made official at the Tour and Rec. Board meeting last week that the horse races will be held this year, scheduled Aug. 17-19. At a previous AG13 board meeting in December, it was unclear what was going to happen with the horse races. And, even though the White Pine County Fair would have still taken place, in addition to the 4-H Livestock show and sale, the horse races brings a lot to the weekend event. County Commissioner Steve Stork made mention in a commission meeting earlier in December that the horse races were a no go, and that comment was later retracted. Several Horse Race Committee members stood before the board meeting that night and discussed the need for help, and began working together to find a solution. Bill Panagopoulos commented on the announcement, “Despite earlier reports, to the contrary we are in fact planning on having horse races as part of the 2019 White Pine County Fair. Panagopoulos explained how each year the task of of putting the races together was reportedly becoming very trying, due to competition for quality horses with other races and other tracks. Horse Race Committee members Kevin Robison, Marietta Henry and Wayne Cameron were contacted for comment as well. The consensus? Excitement was expressed quite a bit, knowing that the horse races would continue on, in addition to gratitude for the AG13 Board’s decision to help. Challenges of needing additional volunteers and a chairman seemed to be something each committee member mentioned during discussions with each one of them. 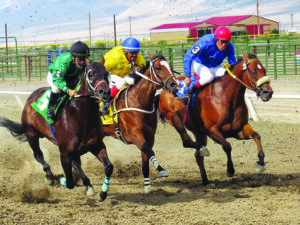 There are still some concerns about the date of the horse races coinciding with the event in Evanston, Wyoming, but logistics of it are being worked out. Henry explained in the Tour and Rec. Board meeting that paperwork for the Horse Race Committee to become a 501(c)3 is being finalized. Henry also mentioned the horse race committee would be attending the next White Pine County Commission meeting to ask for assistance with funding for the purses and with assistance in negotiating insurance for the jockeys’. “To be a bonafide track, you have to provide workers comp for jockeys and it has increased tremendously. I would like to see the county sponsor a race as well,” Henry said. This years event will mark the 84th year. An event that brings in thousands of people from out-of-town, as well as local participation. “Our community derives financial benefits from the horse races in so many aspects, looking forward to seeing everyone at the races.” Henry said.